There is a whole-home DVR solution for everyone. Whether you subscribe to cable, satellite, or TiVo, or use an HD antenna to pick up broadcast stations, there is a way to get DVR in multiple rooms of your home. Not all of the solutions are easy and some will cost you extra money, but it is possible. Let's look at your options for recording TV in more than one room. 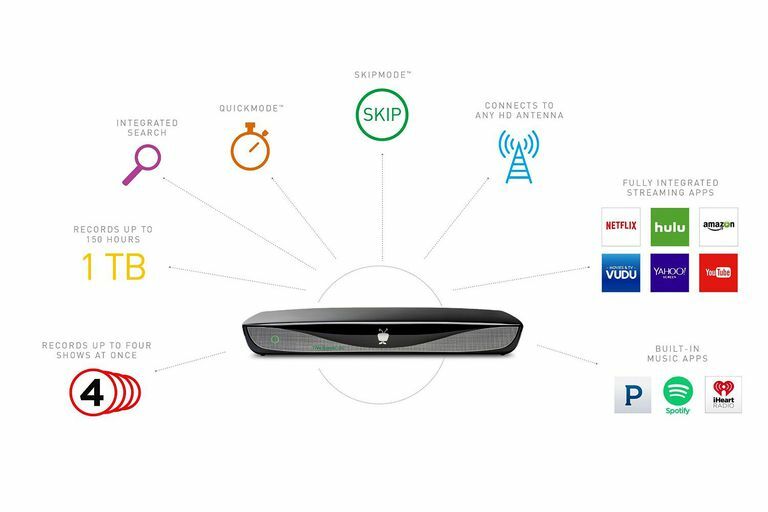 TiVo remains one of the leaders in DVR technology and many cable subscribers find the monthly service plan more affordable than their provider's offers. When it comes to whole-home DVR, this is one of the easiest set-ups you can get. With one of TiVo's main set-top DVR boxes, all you need to get is a TiVo Mini for each of your other TVs and you're good to go. This goes for both the cable DVR, the Bolt, and the over-the-air (OTA) DVR, the Roamio OTA. Many cable and satellite content providers know that people don't want to watch all of their recorded shows in one room. Almost every company offers the ability to have a single leased DVR provide content to several TVs in your home. Of course, you can expect to pay more for a DVR service that extends beyond a single TV, between two and four rooms. Some companies charge a nominal fee for this upgrade while others can be quite expensive. In addition to whole-home DVR options, many cable and satellite companies also offer the ability to watch live and recorded TV on devices like smartphones, tablets, and computers. So, for instance, if the kids don't need a TV in their rooms and have a tablet or laptop instead, they can take advantage of the streaming and recorded DVR content. If you rely on an HD antenna for local broadcast TV, there are a few DVR options that will work on more than one TV. These do require more hardware and you should have a good internet connection in your home, but it is an option for recording programs on ABC, CBS, NBC, Fox, and PBS. Tablo is one the best options and a 24-hour channel guide is free (a two-week channel guide is available for a small monthly subscription). You will need an internet streaming device like Roku, Amazon Fire, Android TV, or Chromecast. Also, an external USB hard drive is required for recording. Channel Master is another option that works in a similar manner to the Tablo. You will need the same accessories as well. If you really want to record your favorite shows on broadcast TV stations, either of these options used in conjunction with your streaming device is a good, affordable option to look into. Windows Media Center (WMC) was once one of the best systems when it came to whole-home DVRs. While a home theater personal computer (HTPC) with WMC may cost you more upfront than most other DVR methods. Paired with what are called Media Center Extenders (namely the Xbox 360), a PC with Media Center allows you to use your home network to send TV everywhere in your home. A standard Media Center system can support up to five extenders. Really, that's a total of six TVs that can all be run by one PC. WMC remains an option for home-built HTPC users though with the introduction of the Windows 10 operating system, WMC was discontinued. There are solutions that are similar to the function of WMC on a Windows 10. However, many users who rely on this program for their HTPC have chosen not to upgrade the operating system. SageTV is another HTPC solution that will allow you to use extenders (the Sage HD-200 or HD-300) to power additional TVs in your home. Again, this solution has been replaced for the most part and SageTV was sold to Google. The software is still available as open source and may be a viable option for advanced HTPC users who don't mind messing around with software and hardware. Though more complicated than WMC, SageTV does have advantages over Microsoft's offering such as placeshifting and support for more types of video content. A shortfall of SageTV, however, is the fact that in order to get digital cable or satellite to work, you'll also have to work a bit. While WMC supports CableCARD tuners, SageTV does not. That means that you will have to use other means to get those signals into your PC. This may or may not be worth it to you. If you are an OTA user, however, SageTV will work just as well as WMC in terms of getting TV everywhere in your home and in some cases, beyond. As you can see from the many options available and those that were quickly replaced by the latest technology, TV watching is transforming rapidly. It is easier than ever to watch your favorite shows on your own schedule and a DVR may not always be necessary. In fact, many people are cutting the cord and switching to streaming TV altogether. With streaming device options like Roku, Amazon, Apple TV, and more, you can often find everything you need. Even local news channels are getting on the bandwagon and utilizing these services. NewsOn on Roku is a perfect example as it looks for the closest participating news broadcast to your location. When it comes to sports and network TV shows, you will also find apps and channels on many of these devices to view them either live or recorded. The point is that we are living in a new era of TV and your options are growing every month. Investing the time and money into a new DVR system may not be your best option, especially in the long term. It would be wise to look into all of your options. Keep in mind the programming you enjoy most and find out how best to watch that on your own schedule. Also, if you're patient, a solution to your issue will likely arise soon enough. Many cord cutters have discovered that they don't miss the old ways of standard cable and DVR systems, they simply had to look at their TV experience in a new way. Also, depending on your needs, you can find many free or inexpensive ways to access what you watch the most and never miss out.